We’d like to give a HUGE thank you to our wonderful volunteer groups that gave of their time for the MLK Day of Service. Habitat for Humanity, City Year, as well as several families assisted in our Member Share Grocery Program by stocking shelves, bagging groceries for our members, and sorting donated business attire in our Member Marketplace. United Against Poverty greatly appreciates the hard work of volunteers. 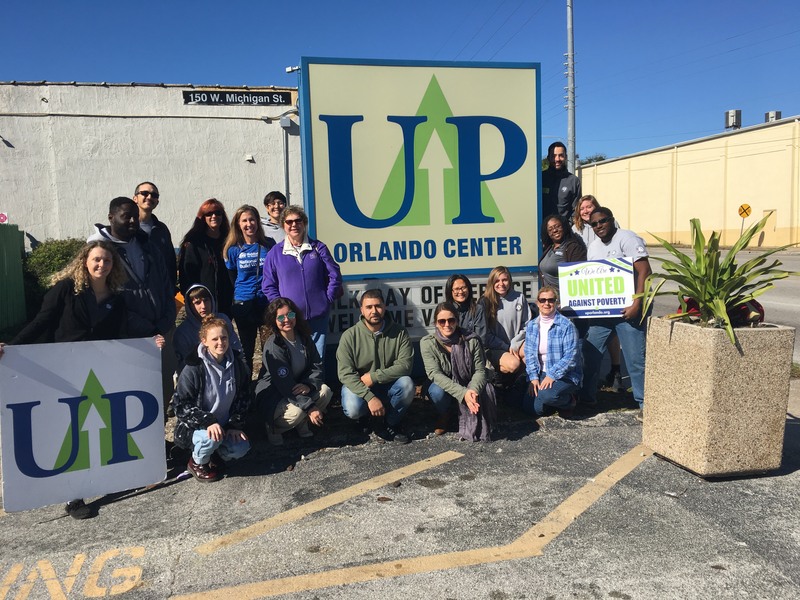 Find out how you can get involved at uporlando.org/volunteer. Family Volunteer Night: Our monthly Family Volunteer Nights bring families together in the spirit of service. Join us from 5-8pm on the second Friday of every month for a memorable evening spent learning the joy of giving back. Pizza is provided and all ages are welcome! To sign up, please visit our Eventbrite page! Quack Attack 5k: Volunteer spots are still available, sign up today by emailing Monique Stewart at monique@unitedagainstpoverty.org! TeamUP 360: 45 volunteers every day. 360 days a year. Volunteer to end poverty for good. Sign up today on our volunteer page.